Although the original Gause Built 26 truly seemed to have all the best attributes of a flats boat, and a sport fishing boat, and seemed to meet all the other parameters originally laid out for it, the Gause family has done several significant redesigns of the boat, the most recent completed in the summer of 2011. Over the years, the boat has gotten stiffer, lighter, drier, and faster. 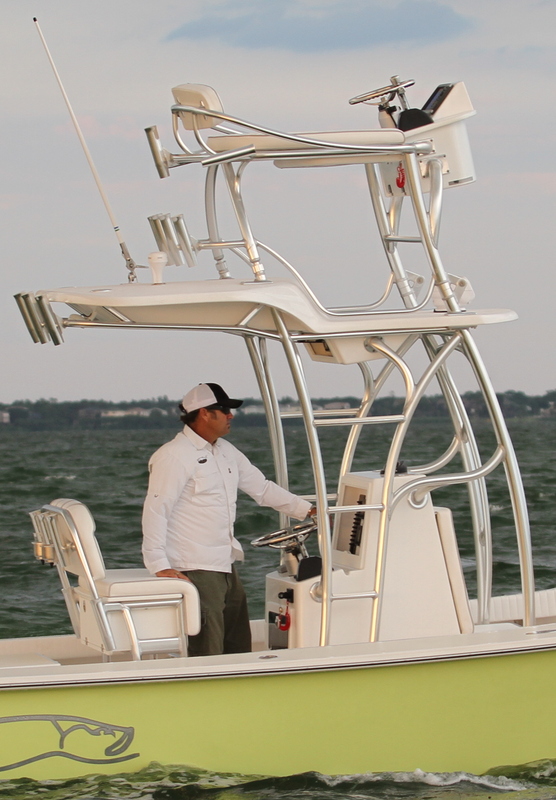 As a custom boat, it continues to evolve, but here are some of the features of the Gause Built 26 that make it the best fishing boat in its class. Flared bow for a dry ride. Being out on the water is great, but being covered with water is not! 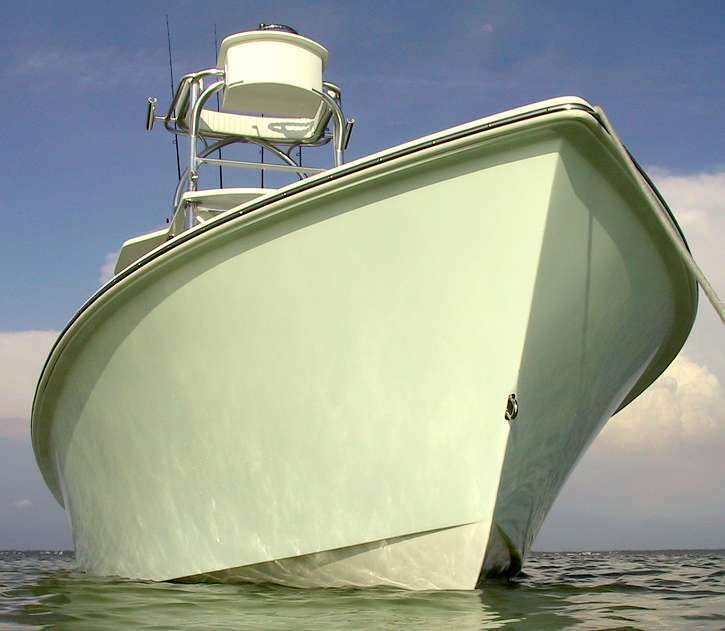 A dry ride is a better ride, and with that in mind, in 2004, Gause Built Custom Boats created an all new hull mold. 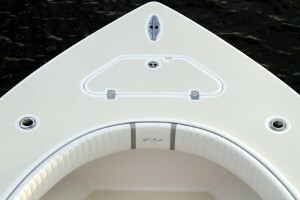 The new design incorporates more flare in the bow to divert spray out and away from the boat and passengers. This not only contributes to passenger comfort, but it just plain looks beautiful too! Click on the image to the left to see for yourself. Reverse chine for a stable ride. Stability is another critical aspect of comfort underway, and the new 26 hull incorporates a wide reverse chine for a faster, drier and more stable ride and better directional control. 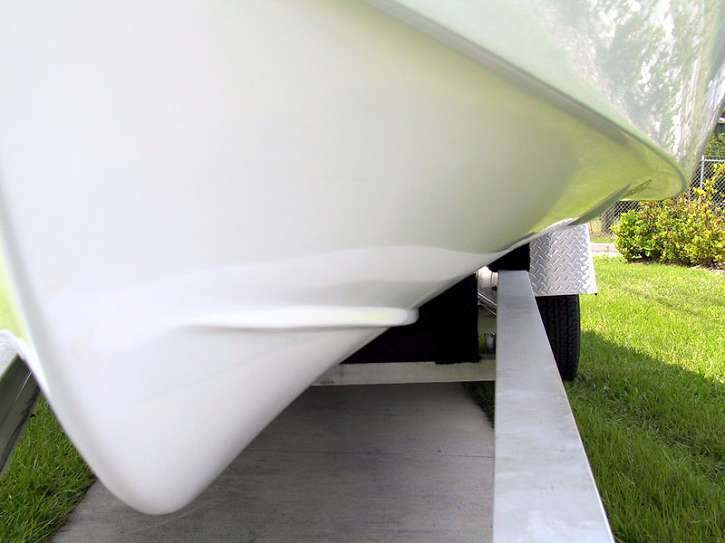 Reverse chines are simply tapering edges of the hull bottom, bent down to supply huge lift and stability at all speeds. The lift is used to raise the hull out of the water, producing less wetted surface area and dramatically decreasing the draft of the hull creating a faster and more easily driven boat. The reverse chine will also shear the water down and away from the bow creating a very dry ride as well. 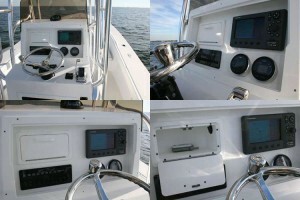 In a center console boat the console serves many purposes. It provides storage, keeps the helmsman dry and provides a mounting place for much of the equipment. Having a sturdy, well thought out and intelligently designed console makes a world of difference. The console in the Gause Built 26 is a culmination of many hours spent using boats, and several redesigns to incorporate new and better ideas. The current design is taller that before, offering more space and better protection from the elements. 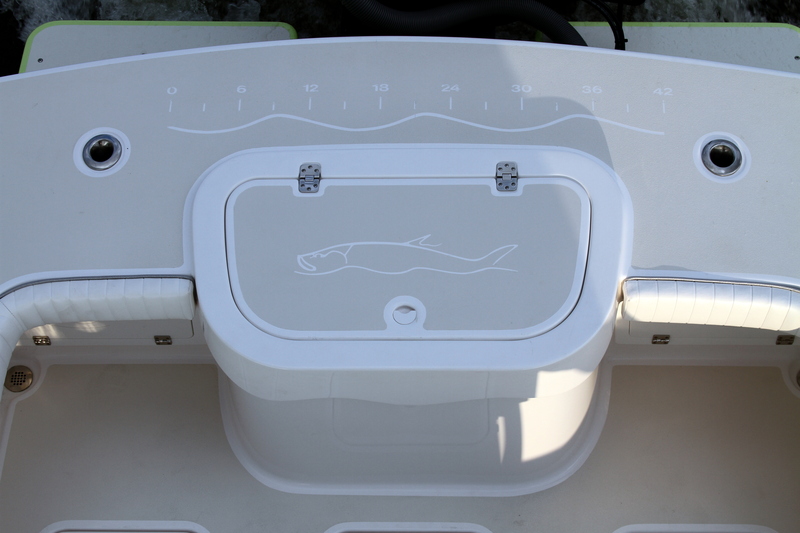 It is integrated carefully with the tower, and has numerous innovative features that help it stand apart from the typical console in a fishing boat. 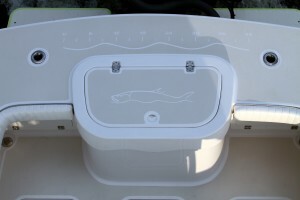 Features like this help make the Gause Built Boats the very best on the market. The folding tower on the Gause Built 26 features quite a few new innovations. Perhaps the most notable is a fiberglass “hardtop” in place of the usual canvas top. 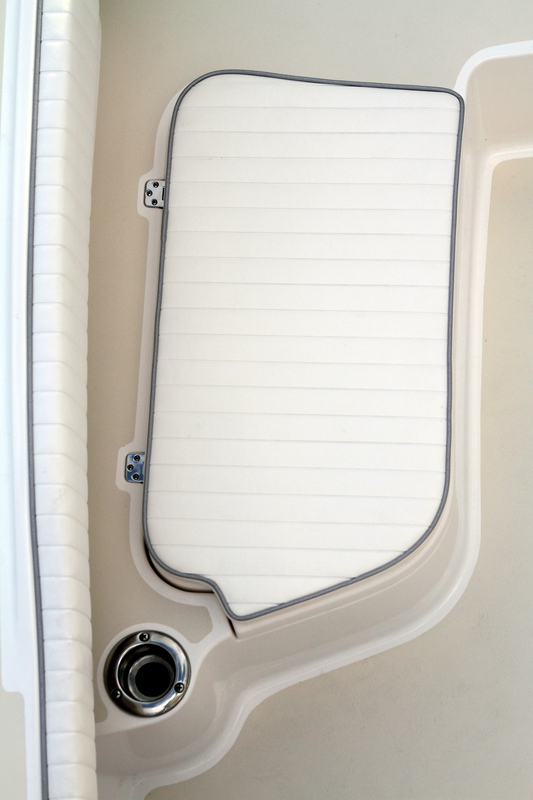 This top is strong enough to walk on, even behind the steering station, and when this option is ordered the electronics box becomes an integral part of the hardtop creating a clean, beautifully finished look. This top also includes a forward “brow” which provides a little more protection from the sun for the helmsman when at the lower station. Wide gunwale for sure footing. When fishing, being able to quickly and easily walk around the perimeter of the boat can often make the difference between that big catch, and a big “fish story”. Wide gunwales with proper non-skid also make it easy for several anglers to move past and around each other when the action is hot and heavy as well as making docking easier and creating more comfortable seating spots around the boat. With that in mind the new Gause Built 26 deck mold incorporates a wider gunwale than before to once again make the boat easier to fish. You’ll especially appreciate this feature when you’re casting for bait. The fish aren’t always where you expect them to be, and the result is that some days you have to move the boat often. Nothing makes this more frustrating than a poorly designed anchor locker. The new deck mold for the Gause Built 26 incorporates a large top loading anchor storage locker designer to be as easy as possible to access. You can walk right up to the bow without stubbing your toe and there’s great support at knee level while you lift the anchor from it’s custom built hanger. The door incorporates a notch for the rode and it’s all convenient to the pop-up bow cleat. There’s simply no easier anchoring arrangement than this for a fishing boat this size. Comfortable seating with best quality cushions. When it comes to comfort on a boat one of the most important considerations is the seating. Realizing this, Gause Built Boats re-engineered the seating arrangement to create a more comfortable position, and has incorporated even better materials in the cushions in all areas. 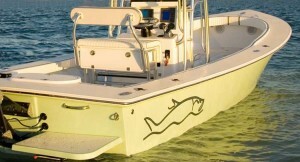 You can rest assured that this boat will provide one of the best rides you have ever had in an open fishing boat. 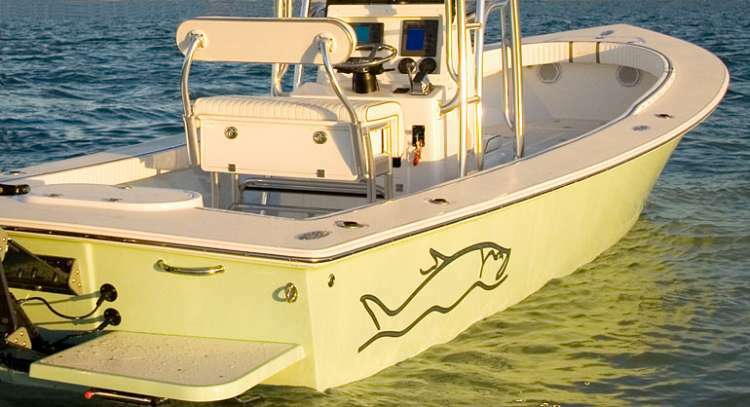 Who wants to buy a gorgeous boat and then stick an ugly, adhesive “Fish Ruler” on the gunwale? Why not consider this beautifully inlaid fish ruler as an option on your new Gause Built Boat? 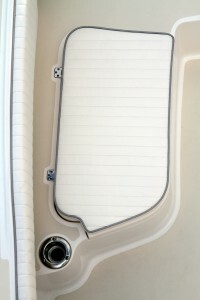 This scale is an integral part of the non-skid surface in the transom of the boat, just aft of the baitwell. Nothing could be easier or more convenient than to always have this available right where you need it. Toe room for safe and comfortable fishing. Because of the inherent shape of the hull in most fishing boats, as you move out toward the gunwale to cast you often stub your toe on the hull liner before your leg contacts the inside edge of the gunwale. This can put you off balance, and if the boat is rocking a bit can make casting less comfortable. When the boat is moving around the safest and most comfortable position is standing with your legs against the inside of the gunwale and your feet spread and flat on the floor. No matter where you stand in the new Gause Built 26 you will be able to attain this position without stubbing your toes. Your casts will be longer and more accurate because you are, quite simply, more comfortable and stable in the boat.